"Would You Like To Discover The Correct Approach To Affiliate Marketing?" There is a common misconception surrounding affiliate marketing and it's a misconception that might be costing you a significant amount of money. One of the main things that most people don't realize about affiliate marketing is that it isn't something to do when there's nothing better to sell. Affiliate marketing is used by some of the world's biggest companies and has provided the type of financial benefit that people like us can only dream of. Affiliate marketing isn't just for newbies. It isn't just for people too small to make a bigger dent in the world and it isn't just for people unable to create their own products. Affiliate marketing is one of the ways the Internet's biggest earners make their living and if you aren't doing all you can to profit from affiliate marketing, you are literally not taking the money that's dangling out in front of you. I've always looked at affiliate marketing as sort of the shy kid in the corner of the high school dance that girls would dance with, if only he got the courage up to ask one of them. You can have a lot of success with affiliate marketing, if only you could summon the courage to realize that it's a skill that you need to learn to do correctly. I think that one of the problems with affiliate marketing is that anyone can surf over to clickbank, sign up for an account, sign up for an affiliate program, build a website and start selling. For people who haven't learnt how to correctly sell products, such a scenario could be devastating. Statistically speaking, the overwhelming majority of people who attempt to sell affiliate products never make more than a few sales (around 95%) and more than a handful of those who fail do so because they never learnt how to succeed. Affiliate marketing is something that needs to be learnt. It's a skill like riding a bike, painting a house or designing graphics. It's not something you can learn on your own easily. I'm sorry if I keep harping on this point, but I'd really like to see you avoid making the same mistakes I've made. You see, long ago I started making money online. I think I started long enough ago that it was easy to make money. I had some AdSense sites and they were doing pretty well. I knew though that the big money wasn't in AdSense and that I needed to start selling products to really turn my hobby into a business. Naturally, I gravitated towards affiliate marketing and tried out my luck selling products to the traffic I already had. I knew that the process wouldn't be quick, so I wasn't nervous when I wasn't making any sales. I really had no idea why I wasn't selling any of the products I was promoting, but I had a million different theories. Mostly though, I figured I needed to give my new business time get started. No one makes a million dollars overnight and I knew my sales would eventually come. All that I had heard for the previous couple months was how profitable affiliate marketing was, so I knew that I shouldn't be worried. I continued doing what I was doing and I was confident that things would pan out. A couple months later, I was depressed, angry and exhausted. In the few months I'd been working with affiliate products, I hadn't made more than a half dozen sales. I was working around the clock to try to improve the way I marketed my affiliate products, but still, nothing was working. I became obsessed with optimizing my sites and I often would work throughout the night making as many small changes as I could, but still, no sales were coming in. Eventually, I reached my limit. I wasn't selling squat and I'd had enough. I took down my sites and stopped selling completely. I unsubscribed from all the different affiliate marketing email lists I joined and decided that everyone who claimed to be making big money from affiliate products was either a liar, a cheat or both. Apparently, I hadn't unsubscribed from all the lists, because a couple days later I got an email from one of the affiliate marketing 'gurus' promoting some new affiliate product. That was the last straw, I had enough of hearing about how awesome affiliate marketing was and how it could make anyone instantly rich. I sat down in front of my computer and sent the most scathing email I've ever written to this guru. I told him he was a fraud and a swindler and that he should be ashamed of himself for continuously lying to people. When I get mad, I can really be bitter. To my surprise, this guru emailed me back almost immediately. He apologized for my bad experienced and told me that he fully believed in the affiliate process. He said that to prove his good will, he'd counsel me through the affiliate process so that I could see exactly how I could get it to work for me. Well, this story wouldn't be very good without a happy ending and thankfully for both me and my business, it does! This guru (who asked to remain anonymous) showed me what I was doing wrong and how to do things right. I couldn't believe how many different things I was doing wrong. In just a matter of days, my affiliate products were selling and I was making money. With his help, I was finally on the right path towards making real money online. After the help this guru provided, I offered to pay him for his time and service, but he wouldn't hear of it. He said he helped me to restore my faith in the industry. He said that if I wanted to show my appreciation for his help, that once I got my business running and I was confident in my ability to consistently make money online, that I would dedicate a portion of my time to helping other people learn how to properly sell affiliate products. It's now a couple years later and I know that I'm finally in position to help other people who were once frustrated and angry like I was. It is with this in mind that I created 7 Ways To Hidden Affiliate Profits to help everyone learn from my mistakes. Discover How You Can Profit From Affiliate Products! Selling your own affiliate products can be an extremely profitable venture, and it's the type of business that can generate a substantial amount of income for years to come. 7 Ways To Hidden Affiliate Profits will teach you how to make the most out of every aspect of the affiliate marketing industry. You'll learn the secret behind converting your traffic, making sure your salespages stick to the best selling tactics, creating your own sales funnel, finding the keywords that will drive the paying customers, writing effective Web 2.0 articles, finding those hidden products that'll really sell and setting your business up for continued residual income. I spent months and who knows how much money learning how to do things correctly. For one low price, you'll get to benefit from my experience. Create Your Own Sales Funnel! Learn How To Effectively Market Affiliate Products! Develop A Plan For Residual Income! Mine For The Right Keywords To Build Your Business On! Discover The Diamonds In The Rough! Utilize Web 2.0 Techniques For Your Benefit! Don't Turn Your Back On The Income You Need! 7 Ways To Hidden Affiliate Profits is the eBook that you've been waiting for to boast your online income. If you have struggled to sell affiliate products in the past, then you know how valuable this book can be. Affiliate marketing can provide your business with a reliable channel of income month after month. Effectively selling affiliate products doesn't require magic, voodoo or anything supernatural. Affiliate marketing doesn't need to be a complicated or complex process either, but it's important to remember that affiliate marketing is a business just like any other and to succeed you need to be pointed in the right direction. Let 7 Ways To Hidden Affiliate Profits guide you so you can learn things right the very first time. Everyone works best in their own way and it's important to note that there is no 'best' way to create your own personalized affiliate marketing plan. You must, however, realize that there is a very clear distinction between doing things your way and doing things wrong. Are you confident that the knowledge you currently process is enough to take you where you want to go? If not, then this is one eBook that you can't afford to live without. No other book will show you exactly what you need to do to make your affiliate program a rousing success. Learn today what you need to know to profit today. 7 Ways To Hidden Affiliate Profits has already made hundreds of people thousands of dollars, let it help you too. 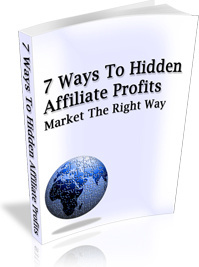 Buy 7 Ways To Hidden Affiliate Profits right now and start selling affiliate products. Secret Tactic 1: Don't Go With The Flow! Secret Tactic 3: Using The Funnel!